Autumn Cthulhu . .. it's not just for autumn any more! OK, it’s actually spring here in the Northern Hemisphere. So what? I’m still delighted to announce that the long-awaited Autumn Cthulhu anthology (edited by Mike Davis) is available now from Lovecraft eZine Press! This one has a killer TOC, with 18 stories and one poem celebrating the darkest and most Lovecraftian aspects of the season. It’s available in both paperback & Kindle formats. And, yes, I do have an item in it. Where did you think that poem came from? For more information, & to order, check here. Suffering from cyber-burnout already? How about checking out some cheap cyberCthulhu instead? Just in time for the holidays (gifting for or escaping from), the Fungi anthology is out from Innsmouth Free Press. Edited by Orrin Grey and Silvia Moreno-Garcia, the book is available in special edition jacketed hardcover (with three extra stories plus ten black & white illustrations), paperback, or ebook form. For all the details -- including a TOC that includes such authors as Jeff Vandermeer, Laird Barron, Lavie Tidhar, Molly Tanzer, Nick Mamatas, W.H. Pugmire, & Yours Truly -- check here. I just got my hardcover today, & it's 342 pages of serious strangeness in a very nicely produced package. The slick jacket is in full color. Like most of the people who have reviewed this short story by the Preston/Child team, I desperately wished Extraction could have been longer. I didn't feel cheated of my 99 cents, but one can never really get enough of the Pendergast family saga. Talk about Southern gothic! That said, this is a fast, well-crafted, & deeply creepy glimpse into Pendergast's childhood with brother Diogenes, & yet another suggestion of how Diogenes ended up the way he did. Told as a sort of fireside tale by Pendergast himself, it's a dark variant on the tooth fairy legend which may leave readers avoiding their dentists for months. Recommended (possibly essential) for long-time fans of the Pendergast series, though probably not the place to start for new readers. The more you already know about all the characters involved, the more chilling this one is. An update on yesterday's Lovecraft eZine post: for those of us who prefer our eldritch terror in portable electronic form, issue #16 is now available for Kindle & Nook. I'm not sure how the estimated page count runs for the Nook, but the Kindle edition appears to be around 91 pages -- for less than one dollar. Truth in LiveJournaling: I haven't got a story in this issue. My only reason for posting this info is to help out a fine Lovecraftian publication -- and to let other e-reading enthusiasts know where to get some inexpensive weekend reading. Thanks also to author Kenneth W. Cain for doing the Kindle / Nook formatting! If you've been wanting to read Lovecraft eZine's monthly issues (5-6 well-crafted stories each) on your Kindle or Nook, but didn't want to risk buying a sample copy to see how they worked for you . . . well, the risk is gone! Editor Mike Davis is currently offering both the February & March issues (in both mobi & epub format ) as free downloads. These are nicely produced e-editions, with text to speech available (at least for the Kindle -- the only format I could test). Free e-Mythos. Now isn't your Monday looking better? For those of you who prefer to consume your eldritch items on Kindle or Nook, there's a handy edition for each device available for only 99 cents. Several stories are also being offered in free downloadable audio -- there's no getting away from the cosmic horror now. 1) Innsmouth Free Press is offering a 20% presale discount on its latest anthology, Future Lovecraft. Orders begin shipping December 6th. This antho offers more than thirty SF-flavored stories & poems, plus interior illustrations and a remarkably disturbing cover. To read the TOC plus a sample story, check here. If you've got a hungry Kindle, you can also find the ebook here. 2) The November issue of Lovecraft eZine is up now, with five tales of eldritch horror to read for free online here. Again, the cover of this one is pretty disturbing -- be sure to click on that artwork to enlarge! Kindle or Nook readers can also download this issue for only 99 cents here, & help support a top quality Lovecraftian blog/zine. Truth in LiveJournaling: I have work in both these publications. My villanelle "In This Brief Interval" appears in Future Lovecraft, & my Southwestern Mythos tale "Desert Mystery! Gas & Go!" 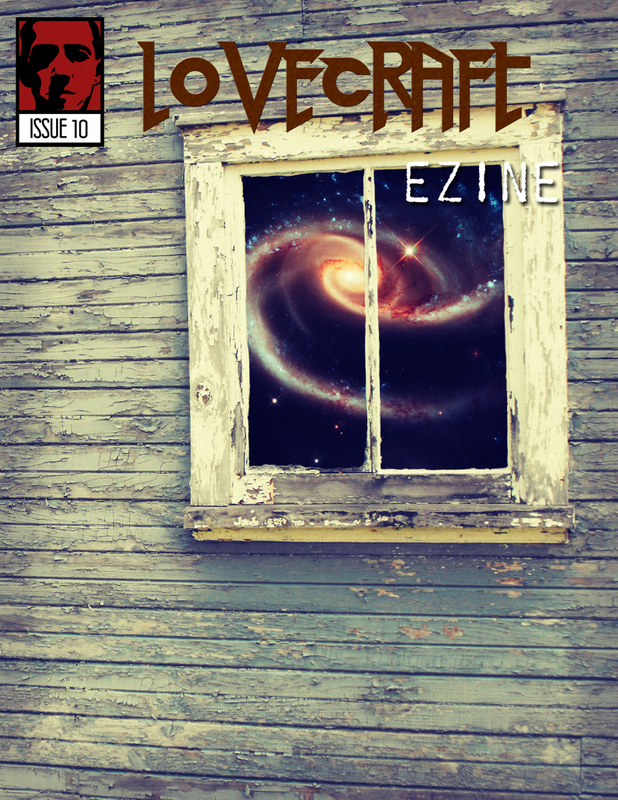 leads off Lovecraft eZine #8.
Who says there's nothing good about a Monday? 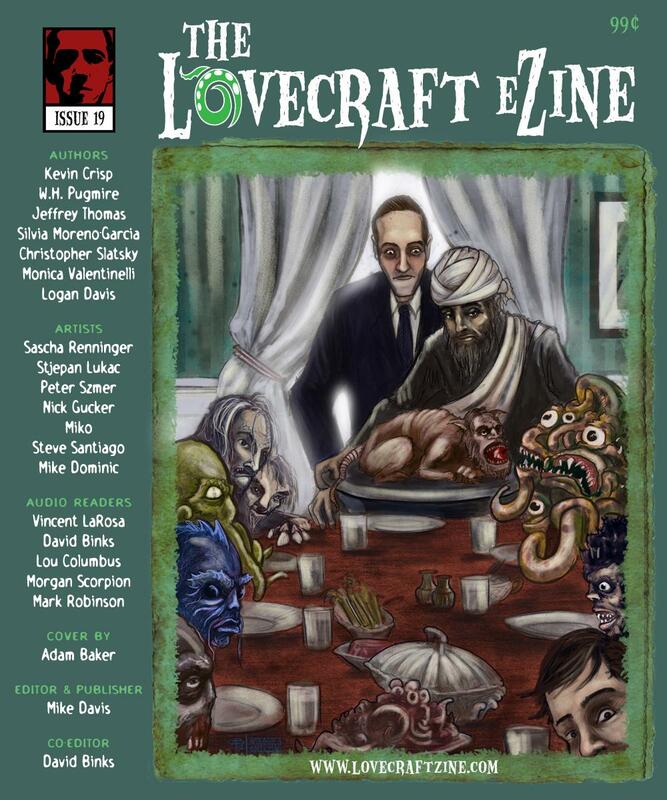 Issue # 7 of The Lovecraft eZine (with appropriately themed holiday cover) is up for your reading pleasure today, here. Five stories of cosmic horror, plus disturbing artwork -- and all yours for free, as usual. However, if you'd prefer to read this bounty on your Kindle or Nook, you can still download a copy for 99 cents here. All back issues are also available. This us a busy week for Lovecraftian e-publishing! Issue 7 of Michael Davis's Lovecraft eZine will be published on the website on Monday, but it's available for download to your Kindle or Nook today. The cost is just 99 cents, & a purchase provides valuable support for both the publication & Mike's very informative blog on all things Lovecraft. To see a preview of Issue 7 -- plus link to one free story -- check here. To download Issue 7, go here. For anyone who might be concerned, I've already downloaded Issue 7 myself (to my Kindle 2) & checked Text-to-Speech. It is there, & it works. I realize this LJ has taken on a distinctively Innsmouth Look lately . . . but the good stuff continues to flow from this Lovecraftian blog/micro-press. Today sees the release of issue #8 of their Innsmouth Magazine, & the first to be released in Kindle and ePub editions in addition to the online posting of stories and the free PDF download (with pretty -- or at least eldritch -- pictures). The new ebook editions are only 99 cents, and are being offered as a way to fund the ongoing strangeness which is IFP. All information on this new issue -- with 6 stories, and an archaeologically themed cover which looks good even on my black & white Kindle screen -- can be found here. Now, if I can just figure out how to keep my Kindle from growing any more tentacles . . .
Got a Kindle with a craving? A Nook in need of a nosh? Whatever reader you've got, Innsmouth Free Press has just made it easier to feed. For the whole month of October, IFP is offering a 20% Smashwords discount on its three ebooks: Candle in the Attic Window, Historical Lovecraft, & Fraterfamilias (an urban fantasy thriller). Since they're priced very reasonably to begin with, the discount puts things down to the Seriously Cheap range. I've got two of these titles on my Kindle 2 already, and they are well-formatted. Text to speech is enabled. Check out all the details here, and happy Friday! Lovecraftians with e-readers will certainly want to know that Innsmouth Free Press is also offering their new anthology Historical Lovecraft as an e-book (all imaginable formats) -- and, until April 20th, it's on sale at 20% off, too! If you haven't quite decided to buy yet, there are now two free sample stories available as well. Get all the details -- including a complete TOC -- here. This is mostly for fellow addicts of Charles Stross's excellent "Laundry" series-- novels and stories in which Lovecraft's Mythos and the British secret service collide. "A Colder War," which seems to be a somewhat related novelette of the Cold War gone horribly wrong, is available for reading online for free here. Thanks,Infinityplus! Sadly, the site is no longer being updated . . . .
For those with e-readers of whatever nature, Charles Stross's short story collection Toast (which contains "A Colder War"), is also available for free download at Manybooks.net, here. I just finished reading this on my Kindle over the weekend, and I can't recommend it highly enough for Lovecraft fans who enjoy a little conspiracy theory with their Mythos. Thanks also to the Innsmouth Free Press contributors' e-mail list, where I found out about this tale to begin with!